New material from Jean-Guillaume Cabanne, and it arrives with a real spring in its step. 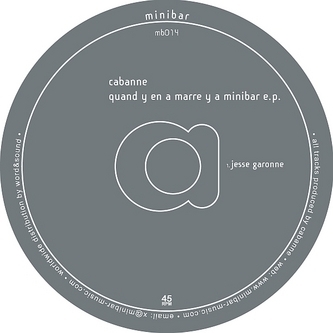 Both 'Jesse Garonne' and 'F. Key' lollop along with a far from rigid 4/4 swagger, with the latter dressing itself in jazzy, yet fragmented Rhodes keys while the former seems content to experiment with beat edits for an eloquent nine-and-a-half minutes. Finally, a remix of F. Key by Barbara & John Thomas chops and stutters about the place for a thoroughly enjoyable variation on the source material.